Photo Credit: Hester Bischot | Flickr - Photo Sharing! Passage and Piaffe aren't tricks. Introducing your horse to them too soon can spell disaster. Here is how to prepare your horse for these amazing movements. ​Here is a video clip of one of the great dressage masters, Reiner Klimke, performing piaffe and passage. Many times, people watch these movements and charge out to the barn to teach their horse these "tricks". And end up with very frustrated, sore, and demoralized horses. These dressage movements are like the triangle at the top of a pyramid. You wouldn't try to place that triangle up in the air and expect it to remain there. Instead, you would build the pyramid from the bottom up, and then put that triangle on the very top as a perfect finishing touch. The same with piaffe and passage. If you try to teach them to your horse before you build the foundational layers that support them, expect everything to collapse in short order. So here is the progression that you need to follow in order to get there without making your horse (and you) crack up or break down. First, fully appreciate walk, trot, canter, and gallop are all separate gaits. Your horse has to be strengthened and conditioned to do all four (or at least walk, trot, and canter) with ease and rhythm before advancing to passage. If you try to teach your horse these movements before he is developed enough to support the demands they make on his body, you will end up with a very sore and possibly injured horse. Second, walk builds muscle, trot builds rhythm, and canter/gallop builds cardiovascular strength and endurance. Don't think of these gaits as just something horses do. Think of them as means towards building athleticism. Third, introduce lengthening and shortening of strides. This requires having an elastic contact through the reins from your hand to the horse's mouth. You have to have "feeling" hands in order to do this. One way to tell whether you have this "elastic feel" is to push your hands slightly forward toward the horse's nose. If your horse stretches forward to re-establish contact with your hands, then you know your contact is comfortable for him and he wants to stay in contact with you. Fourth, try this at trot: As you push your hands forward, the horse will also automatically lengthen his stride. Allow him to go forward this way for several strides. Then squeeze your hands gently and bring them back to their original position while shifting your weight back slightly in the saddle and tightening your abs. The horse will collect, that is, his frame will become shorter from nose to tail and his weight will shift back onto his hocks. That is the frame you see in the photo above. It is called collection. Only once your horse can do all of these things with ease, comfort, and strength should you advance to piaffe and then passage. In piaffe, you ask the horse to trot while holding him in place. Once he has mastered that, you allow him to go forward a little more. And that is passage. As you can see, all this requires taking lessons with an experienced trainer. A trainer will help your horse understand what is expected, usually by walking next to him with a dressage whip. The trainer may touch your horse's legs individually until he raises each leg in turn as it is touched. She may also place the whip in front of the horse's chest to keep him from moving too forward. By alternating between touching the horse's hind legs and restricting forward movement at the chest, the trainer assists you in making the horse's frame shorter, higher, and lighter. You, in turn, use your lower legs to activate your horse's hindquarters and your hands to keep him in place. Here is a brief video showing this training technique. Be aware that some people frown on this way of training piaffe and passage. Instead, they believe (with some justification) that these movements are natural outcomes of teaching the horse to activate, elevate, and shorten his frame. One other thing to know is that purists insist (again with justification) that the croup must be lowered when the horse is performing piaffe and passage. Too often in today's Olympics, the horse's hindquarters remain level with his back as he performs these movements. But the whole point of training these movements is to develop the horse's ability to carry more weight on his hocks, thereby making it easier for him to turn quickly as was needed in battle. 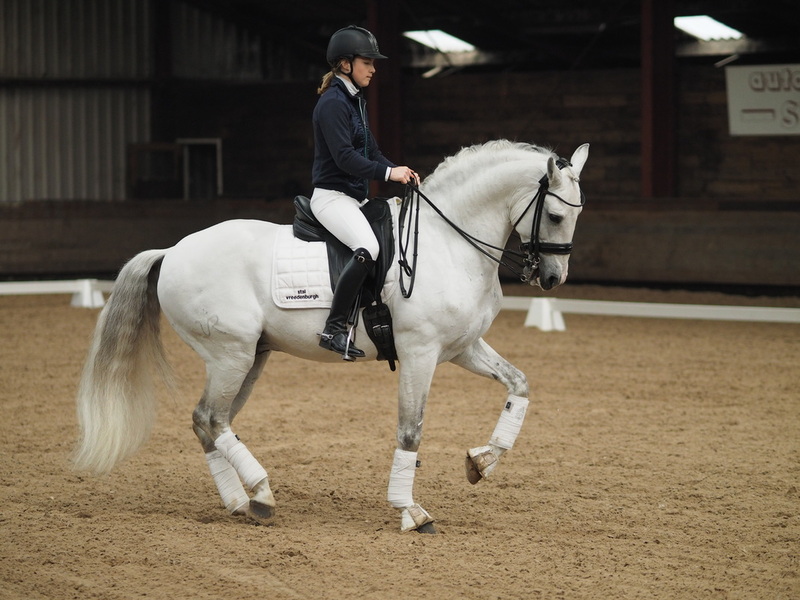 Yes, the origins of dressage training lie in military training going back as far as Xenophon in ancient Greece.